When it’s your business, and the livelihood of not only you but your employees, the roof is important. Whether you’re in need of a new commercial roof for your Atlanta business, or repair, you don’t want to mess around with part-time roofers who do this type of work as a side job, or who are inexperienced. If you’re not sure about some of the people you’ve talked to, we’ve included a few tips to help you ensure you’re choosing Atlanta commercial roofers you can trust. The company comes highly recommended. If the company can give you a few referrals to check out, and you see they’ve done good work for other businesses, it’s a good sign. A roof isn’t something that’s easily hidden, and it’s worth your time to visit with a couple of other companies who have worked with the roofing company and can give you their opinions. Is the company insured and licensed? 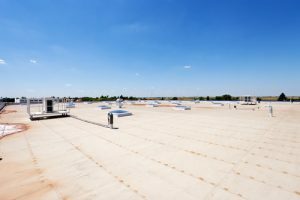 Choosing commercial roofers who are licensed and insured is critical. If a company doesn’t have a license, keep searching. Are prices realistic? We’re not talking about prices that are too high, but those that seem unrealistically low. A solid, quality roof is an investment in your business; when you’re given a cheap or super-low rate, it’s often an indication that either the company is new and doesn’t have any customers, or that the roofers themselves are unaware of the true costs to install or repair a roof. It is often an indication of shoddy work as well, so beware of quotes that seem too good to be true – they probably are. Does the company have a professional website? Most Atlanta commercial roofing companies today have a website; it’s a must, given the competition, and the fact that most people use the internet today, searching for products or services. A website provides valuable information about the company including contact information, years in business, the services they provide, history of the company, certifications, and other information that help inform your decision. Don’t rely on a verbal estimate. You must have a written estimate detailing the work to be done and the costs, so you not only have a physical record of the estimate, but can compare it with other estimates. Roofers who are true professionals know the importance of a written estimate. Professionals will always go up on the roof; after all, how can the situation be assessed without actually seeing it up-close and in-person? You wouldn’t have a contractor give you an estimate on renovating your kitchen without even looking at it – the same goes for the roof! When you choose Kelco Roofing for your installation, repair, or assessment needs, you can rest assured you’re getting the best in the industry. Give our Atlanta commercial roofing company a call today!